Built-in bookcases offer a permanent storage solution with a kind of character that freestanding bookcases simply don't have. These days everyone can use more storage and built-in bookcases offer a great solution. They can store just about anything and everything and can easily be incorporated into any room in the house. They also add a comfortable, lived-in look to a room. Since everyone is looking for more storage, built-in cases can also add value to a home. When assessing the cost of adding built-ins, think about the value it can add if you decide to sell. There are a few different ways to get this type of bookcase. The easiest is to have a contractor come to your home and measure and install the bookcase. Obviously this will cost more than doing it yourself but you'll get a professional looking job without all the headaches.If saving money is the goal, you can try to install them yourself. They can be made from scratch if you have the skills, or they can be made from bookcase kits. All of the materials needed are available at home improvement stores such as the Home Depot. It's a fairly big job either way so make sure you're up for the challenge before beginning. You can also get the look of built-in cases by attaching freestanding bookcases to the wall and adding some molding around the perimeter. If it's done properly no one will ever know they didn't come with the house. Built-in bookcases can be custom made to suit the style of the home. Traditional homes with a lot of architectural details can benefit from built-in bookcases surrounded with molding and extra details. 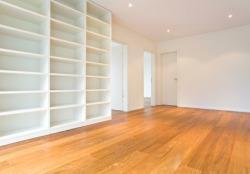 Modern homes can have very simple and spare bookcases that don't call attention to themselves. Some built-is also incorporate doors and panels. The size of the bookcases will depend on where they're going. Built-ins that flank a fireplace or line an entire wall often look best when they reach all the way to the ceiling. When they get too high for arms to reach up, many people often incorporate some type of ladder (this is particularly common in libraries and studies) to make it easier to reach items. Bookcases that line the lower half of a room are also practical and charming. When designing built-ins it's important to think of what they'll be used for. For instance, if they're going to be used as an entertainment center, make sure there's enough room to fit a television and other such items. With built-in bookcases the shelves aren't usually adjustable, so think about your space needs before building. The greatest thing about these bookcases is that they can be made to fit any space and be made in any style. They can be designed to meet specific heights, widths and depths depending on the size of the space and the needs of the homeowner. In small spaces, built-in bookcases can add much needed storage space without having to buy large, bulky armoires and cupboards.